There is nothing better these days than playing the Pirates. Do you want to snap a losing streak? Play the Pirates. Do you want to make your new manager look good cuz you just got the old manager fired? Play the Pirates. With a chance to play spoiler, which is the only thing left to play for, the Bucs get swept, again. There are only 3 games left and they are against the Padres, a team that is WORSE than Pittsburgh. Tonight Ian Snell (6-12, 5.54) goes for Pittsburgh and Josh Geer (2-1, 2.86) starts for San Diego. The game is not on TV, again. Top ranked USC lost last night to Oregon State. Penn State beat Oregon State so that makes Penn State #1, right? 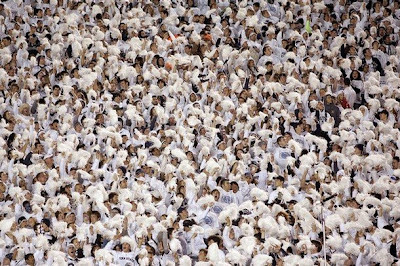 and finally...don't forget to wear white tomorrow.